Mayor Bill de Blasio and Gov. Andrew Cuomo's ongoing feud has carried over from their handling of the Ebola crisis to the current handling of Legionnaires' disease, observers say. CITY HALL — While Mayor Bill de Blasio was hosting a roundtable with officials at City Hall Monday to give the latest update on the Legionnaires' outbreak in the South Bronx, Gov. Andrew Cuomo was doing the same at his Midtown offices. Not only were the two men in separate locations, they appeared to be on different pages. The city said two new buildings had now tested positive for legionella, the bacteria that causes Legionnaires' disease but Cuomo said there were three new buildings identified as having the bacteria. The mayor previewed legislation from the City Council that would make New York City the largest in the country to have regulations regarding the cleaning and inspection of cooling towers, which are responsible for spreading the disease. Cuomo said he didn't know "what the city is proposing" but that there should be a "statewide protocol" dealing with the issue. "I don’t want to have different protocols in different cities so if you own a building in Albany you do one thing, if you own a building in New York City you do something else," said the governor. The ongoing feud between de Blasio and Cuomo has not abated as the city deals with the deadliest outbreak of Legionnaires' disease in its history. The disease, which has struck one of the poorest areas in the country, has killed 12 and sickened a total of 113 so far. Last week, the governor inserted himself into the outbreak, inviting the Centers for Disease Control to send a team in and deploying inspectors from the state Department of Health to scour the South Bronx this weekend. "We are taking matters into our own hands," Cuomo said Friday during an interview on NY 1 where he also said it seemed like the situation was "critical." The city has used testing from the state's Wadsworth laboratory and both city and state officials have said they are in coordination. Cuomo said last week that he had spoken with de Blasio. "It's not unheard of that different levels of government have different approaches," de Blasio said Monday. 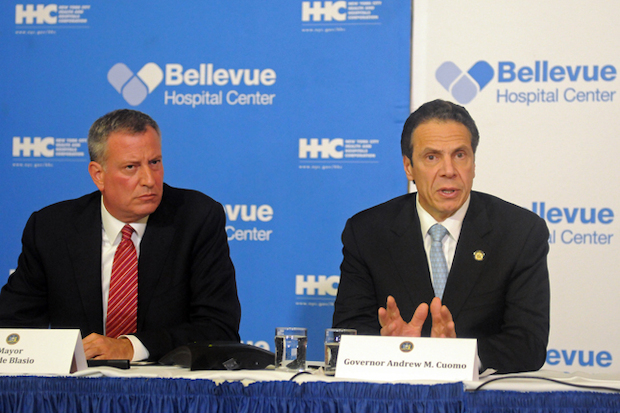 But de Blasio and Cuomo have not appeared together since the outbreak began. While Council Speaker Melissa Mark-Viverito and Bronx Councilwoman Vanessa Gibson, who both represent the area of the outbreak, thanked Cuomo by name, de Blasio only thanked state officials. And on Monday, de Blasio made a distinction between the work the city is doing inside the impact zone in the South Bronx of where the city believes the cluster is focused and the testing the state is doing outside the impact zone. "We will take responsibility for protecting our own people," de Blasio said when asked about the proposed state legislation. Cuomo declined to comment on how he felt the city had handled the outbreak, saying it was not his place. "I do think I’m responsible for the state’s action," said Cuomo. "I am comfortable with the state’s action. I think we have been aggressive. I think aggressiveness is called for," he added. It wasn't until after the governor's press conference that Cuomo aides cleared up that the three new buildings Cuomo was referring to were different than the infected cooling towers de Blasio was talking about. Kenneth Sherrill, professor emeritus of political science at Hunter College, said the differing information is making both the city and the state look bad. "You just don't play politics with public health, it's as simple as that," said Sherrill. "It is absolutely critical that in terms of the information given to the public that all people in leadership must be on the same page." De Blasio and Cuomo have had public disputes on a number of issues, including the minimum wage, pre-K, and mayoral control of schools. Cuomo recently sided with e-hail company Uber and against the mayor over whether the city should limit the growth of for-hire vehicles. And, famously, de Blasio said he received only 15 minutes notice before Cuomo closed the subway system because of an impending snowstorm. The mayor recently criticized Cuomo as a vindictive politician who sabotaged the city's agenda in Albany. The governor has said de Blasio doesn't understand how state government works. There is a precedent for how Cuomo and de Blasio deal with a crisis — and it isn't good. The two men appeared together urging calm during last summer's Ebola cases. But in the days following, Cuomo held another press conference with New Jersey Gov. Chris Christie announcing that travelers from the affected countries who had contact with Ebola patients would face an automatic quarantine at area airports, something de Blasio disagreed with because it might create panic. "They didn't learn from their past mistakes if they are still playing around with public health this way. That's unacceptable and irresponsible for people in their positions," said Sherrill. Unfortunately, he doesn't see any détente between the two in the future. "How do you get two guys to stop hating one another and make peace?" asked Sherrill. "Unless they have infected cooling systems, the United Nations isn't going to get involved."